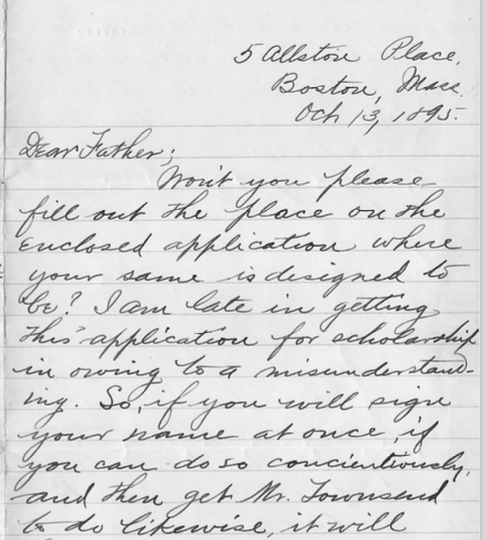 The following letter was written in October, 1895, from Allen, age 24, to his father, William Henry Hartwell, age 50. Won't you please fill out the place on the enclosed application where your same is designed to be? I am late in getting this application for scholarship in owing to a misunderstanding. So, if you will sign your name at once, if you can do so conscientiously, and then get Mr. Townsend to do likewise, it will hasten matters to my advantage. Send it back to me Wednesday please. I enclose receipted assessment. Did your meat arrive all right? How do you like the trade? I went down directly after dinner, having received your letter in the morning. There are some slips enclosed with names on them of persons whom I was to see in regard to joining the Y.M.C.A. Those who were spoken to are designated by lines drawn through their names. The others were not seen. Kindly give the slips to Mr. Johnson. It will save me postage. I went to see Cora but she was not at S & P's. She called on me two days later and we made a visit to Uncle Jacob. She is working at 93 Water St. and has a much nicer place. She advised me to call on her former employer and see whether he could give Foster [Allen's youngest brother] a place, which I did next day, but he had engaged a typewriter, etc. What is Foster's address? Have met three Mifordonians of late: Miss Armstrong, Mr. W.K.Whiting, & Mr. O'Neil formerly of the telephone exchange. Andrew McLoughlin walks over Somerset St. occasionally. I wish that I were to be present at the 50th anniversary of the Milford M. E. Church. According to the program which I saw in Zion's Herald, those who take in all the services will have a rich toast. I hope that you and mother will improve your great opportunity. I heard W. E. Russell and other prominent, some unheard of, speakers at the Democratic rally last week. hit the A. P. A. society as hard as they could. Evidently they dealt this "secret, despicable organization" some terrible blows. Geo. Fred Williams made the last speech. Have just come from church. Despite a terrible storm John Mason and I went to hear I. J. Lansing. The music and service were good. When you want butter, I can save you from 6 to 8 cents per pound, clear, on 30c butter.